Giga-byte is showing a new device on their website with the status ‘Coming Soon’. 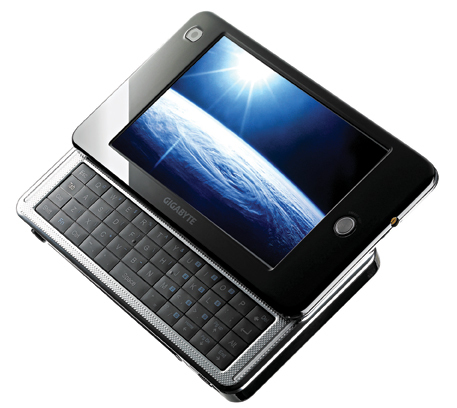 This is Linux-based MID (Mobile Internet Device) with a qwerty keyboard, Including an Esc key!! So finally, it’s possible to ssh to a linux box and vim from almost anywhere on the planet (as long as there is Wifi, GPRS or UMTS/HSDPA). This is really a very neat device. It’s a bit bigger than the average smartphone, but still small enough to be very portable. (15,2 x 8 x 2,25 cm, 340g). It has a intel atom chip running at 800Mhz, 512MByte of memory and a 4GByte SSD for storage. The screen is a 4.8 inch touchscreen LCD display with 800×480 pixels. The device supports bluetooth (2.0), wifi (802.11b/g) and HSDPA UMTS and has an integrated GPS receiver. Besides a mini-usb port to connect it to for example you linux workstation, it also has a usb host port, to connect an external harddisk, usb webcam, scanner, printer, anything (as long as the software supports it). And ofcourse, If you slide the MID open, you will get a blacklight keyboard, with an ESC button. The MID does not support voice calls, but maybe voip calls over umts will work also… Some sites mention that the linux OS is Ubuntu Mobile and that looks very good and usable. Ubuntu mobile comes with a browser based on Firefox 3, and open office. So what else do you need?